If you are facing a burglary charge it is important to have an attorney with a successful history of defending against serious criminal charges. Jeff Dean has wide-ranging experience and success in handling serious criminal cases, and importantly, he has litigated criminal law cases exclusively for 20 years. Mr. Dean was able to get burglary charges DISMISSED even though his client’s DNA was found at the scene of the crime. Besides burglary, Mr. Dean has won DISMISSALS or ACQUITTALS in a wide range of criminal cases, from assault, drug charges and domestic violence, to solicitation, murder and manslaughter. In your particular situation, Mr. Dean will target the best defense campaign and he will aim to win. Under the law you are presumed innocent. Because you have been charged with a burglary does not mean you are guilty. To protect your rights, call Jeff Dean today at (305) 967-6311 or (953) 204-3633. One of the most common felony charges in Florida is burglary, which can take place in several different forms. Section §810.02 of the Florida statutes states that burglary is committed when a person enters “a dwelling, a structure, or a conveyance” with the intent to commit an offense therein, unless the premises are at the time open to the public or the defendant is licensed or invited to enter.” However, even if the person has entered with permission, it can also be a burglary to remain in the structure, dwelling, or conveyance if done “surreptitiously” or after the permission to remain has been withdrawn, with intent to commit a crime. A dwelling in a burglary case means an inhabited residence or any place that is designed to be occupied by people for lodging (even if just temporarily); a conveyance means a car, other motor vehicle, railroad car, ship or boat, trailer or aircraft; and a structure refers to any type of building such as an office building or publicly owned property. Burglary is a first degree felony, punishable by a maximum of 30 years in prison, if while committing the burglary the person also commits a battery or assault on another, is armed with a dangerous weapon, or causes damage to the structure or dwelling in an amount greater than $1,000. It is a second degree burglary, which carries a maximum prison term of 15 years, if there is another person in the dwelling, structure or conveyance at the time the accused enters or remains therein. However, for a second degree felony burglary to be charged rather than a first degree burglary, it is necessary that in the course of committing the burglary, the accused does not make a battery or assault and is not armed with a dangerous weapon. It is also a second degree burglary to enter an emergency vehicle. What are the Defenses to a Burglary Charge? 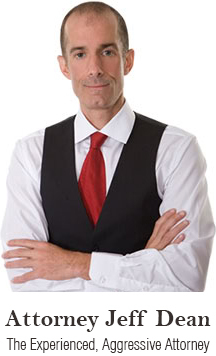 There are several defenses that Miami attorney Jeff Dean may assert in your case. Mr. Dean may show that you did not have the intent to commit an offense when you entered the dwelling or structure. In a burglary case the state is required to prove beyond a reasonable doubt that your intent was to commit a crime when you entered or remained in the conveyance, dwelling or structure. This is a high standard of proof and by showing that there is doubt about your intent Mr. Dean may be able to get your burglary charged dismissed outright. If charged with first degree burglary Jeff Dean may show that you did not have a weapon, that the weapon was not a “dangerous weapon” as defined by the statute, that you did not commit an assault, and did not damage the structure in excess of $1000. Another defense that Jeff Dean may assert in your burglary case is the defense of necessity. Under Florida law, it is a defense to a criminal charge if you committed the act out of necessity. To prove the defense of necessity when charged with burglary a defendant needs to show that: 1) he or she reasonably believed that an immediate emergency or danger existed which threatened the defendant or another person; 2) the defendant had no way to avoid that emergency or danger except by committing the burglary; and 3) the harm that the defendant tried to avoid by committing the burglary outweighed the harm caused by committing the criminal act. Thus, an example of when a burglary should be excused by the defense of necessity is when a person enters a dwelling, conveyance or structure to take shelter in a storm or to flee from another form of danger. Jeff Dean may also assert your actions constitute nothing more than a simple trespass and that your burglary charge must be dismissed. Other possible defenses to your burglary charge are mistaken identity, alibi, or that you committed the burglary under duress. To protect your future, contact Miami and Broward county defense attorney Jeff Dean at (305) 967-6311 or (954) 204-3633.